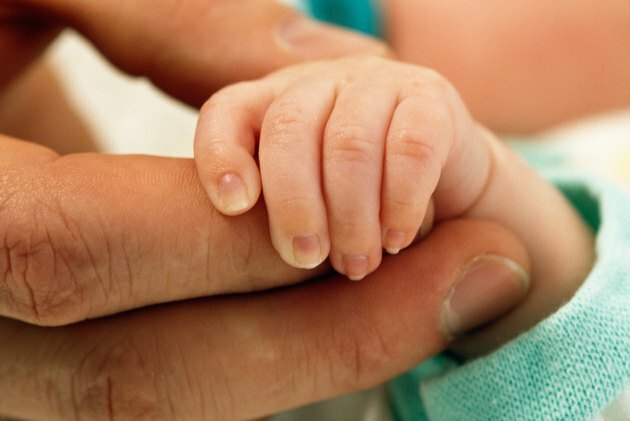 When Can You Clip a Newborn's Nails? A newborn baby's nails grow continuously. Fingernails, which grow about 0.1 mm every day, grow faster in children, in males and in the summertime. Newborn's have little control over their arms and hands. Your might notice that your newborn leaves scratches on his or her face. Parents sometime cover their newborn's hands with the fold-over sleeves of the sleepers that infants wear. A newborn's nails are so delicate that parents might be concerned about clipping them. An early start on keeping your newborn's nails trimmed is both safe and necessary. Your baby may be born with long fingernails, and you may begin to trim them right away. Newborn's fingernails grow quickly -- you might need to trim them several times each week for the first few weeks after birth. Trimming is required to keep the fingernails as short and smooth as possible to prevent your baby from scratching his or her face. A newborn's toenails grow more slowly than fingernails and typically require trimming once or twice a month. Do not bite or tear your newborn's nails. Biting your newborn's fingernails to trim them can spread a herpes simplex infection to the baby's fingers or thumbs. Tearing the nails to trim them is imprecise and can injure underlying skin. A soft emery board or baby nail clippers are usually sufficient to do the job. Baby nail scissors have rounded edges. Using scissors, such as blunt-nosed scissors, and clippers provide more control over how and where you trim the nails. Extra care is required if you use clippers or scissors -- these implements are sharp enough to cut the tip of a baby's finger. Choose a well-lit place and find a position for holding the baby that is comfortable and gives you easy access to your baby's fingers or toes. Hold your newborn's palm and finger with one hand. Keep the finger steady while you trim with the other hand. Press down gently on the skin at the fingertip to clear the way to trim the nails, including the sides. Trim the nails, round the edges and use the soft emery board to smooth away rough or jagged edges. Use the same method when trimming the baby's toenails. If your baby will not be still, try trimming nails after a bath or during sleep. You might also ask someone to hold the baby while you trim the nails. If you prick the baby's skin, stop any bleeding by applying gentle pressure to the cut with a sterile gauze pad. A bandage is not recommended since the baby could choke on it. Your newborn's soft, poorly defined toenails might appear ingrown, but this is normal. If the skin along the baby's toenail turns red, hardens or becomes inflamed, contact your pediatrician. What Makes Nails Grow Long, Strong & Fast?